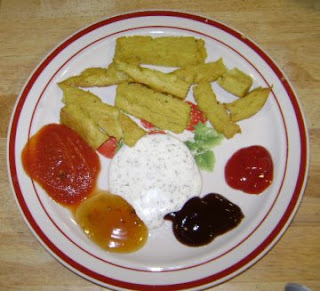 Kate over at the Gluten Free Gobsmacked has a great recipe for polenta fries. You make up a batch of polenta, add in seasonings (I added 3 Tbsp. of nutritional yeast for a little extra vitamin power and flavor and used gluten-free vegetable broth instead of chicken broth), slice and bake in the oven. Here's the link to her wonderful recipe. Everyone in the family (two omnivores, one vegetarian, one vegan) loved them and I did a happy dance having to only plan and cook one dinner meal. We tried them out with an artist's palette of dipping sauces: ketchup, our beloved Sweet Baby Ray's Barbecue Sauce, Creamy Dill Dressing, Sweet and Sour Sauce and Marinara. Consensus: Tomato-Based concoctions rule. Try them out soon; this is easy if you have time to let the polenta cool and harden. **Side note: With a vegan diner in the family now, I went back and tagged a bunch of recipes on this blog, so you can check them out in the right-hand side bar.